While fastenings and buttons had been used on clothes for centuries, it was not until the 19th century and the era of mass-produced clothing that conventions developed around their use. Dresses now tended to have buttons on the left-hand side of their bodice, with small loops to the right. The buttons were fastened to the loops at the back of the dress. Men's clothes had buttons to the right-hand side, and were fastened to the front. 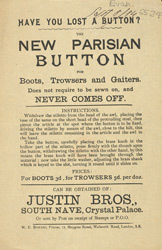 This leaflet advertises the so-called Parisian Button, which could be securely attached to a garment without fear that it would fall off.